One of the battles Great Lombardy Association is doing, in a totally innovative way, is about the concept of “Lombardy” (and parallel to “Lombards”) and the correct use of these terms. In common speech it tends to use the word “Lombardy” to identify the administrative subdivision called “Lombardy Region” created in 1970 by the Italian Republic and the term “Lombards” to identify the inhabitants of that political organization. Obviously, if calling the “Lombardy Region” simply “Lombardy” was only a brisk contraction used in common speech, and if we were aware that the political entity does not coincide with the Lombard “Nation”, there would be no problem. But unfortunately it is not like that: so many people are unfortunately convinced that Lombardy is the Region with the same name and we regret to note that this misunderstanding exists even in academic and cultural branches! To explain the gross mistakes behind this widespread error of interpretation, we must first clarify that talking about Lombard “Nation” we may fall into another semantic trap because in common speech people often confuse terms like “Nation” and “State”, considering them even as synonym in many cases! However, lemmas in question have completely different meanings: if the word “State” represents a legal political regulation exercising sovereign power over a certain territory and people belonging to it, the word “Nation” refers to a group of people who, having common characteristics (such as history, language, territory, culture and ethnicity), identify themselves with a common identity to which they feel they belong (national sentiment). Identifying a State is very simple operation because you only need to locate a legal regulation exercising sovereign power, but identifying a Nation is much more complicated because the identification of characteristic elements (history, language, territory, culture and ethnicity) is subjected to larger subjective evaluation. After a long study of these characteristic elements concerning the populations living in the Lombardy Region and neighboring areas, we came to a conclusion that the Lombard Nation includes the following features: from a historical point of view, it is being defined as Lombardy up to beginning of the nineteenth century, it has been part of Cisalpine Gaul and Longobard kingdom, it gave rise to the Free Communes, the epic of the Lombard League and the Lords; from a linguistic point of view, it has developed Cisalpine ​​Gallo-Romance languages; from a territorial point of view, it inhabits the river Po basin; from a cultural point of view, it has developed a purely Mitteleuropean culture; from an ethnic point of view, it has Celtic-Ligurian origin with a significant Germanic component (Longobard in particular) added. 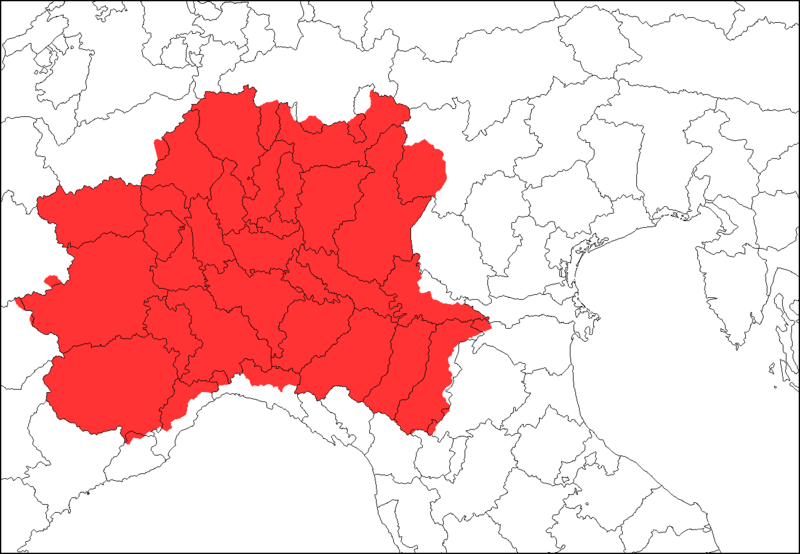 Then just go to empirically test these points to realize that, in addition to territories under jurisdiction of named above entity, the true Lombardy also includes the Piedmont Region, the so-called “Emilia” until the Panaro River, Canton Ticino, Aosta Valley and few strips of land in the catchment area of Po Valley. 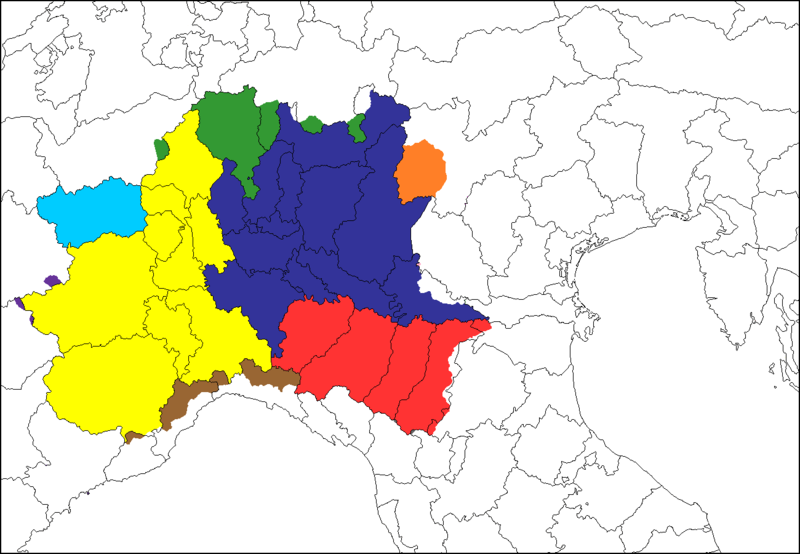 To what is the historical Lombardy other territories can also be added from significant ethnic Lombard point of view, like late Germanized Celtic-Ligurian territories, but who have not been fully on the linguistic level, i.e. Veronese, Trentino, Vicenza, Belluno and Friuli. No one wants to deny that historical events had fragmented people of Lombardy in recent centuries, bringing also to a certain linguistic divergence, and that the feeling of membership that was initially existing had been declining as the years go by, but that does not mean it could not be restored, also considering that it had been weakened because of ideas who have been revealed completely unfounded! Since Lombardy still has all other elements characterizing a Nation, it is clear how the weakened national sentiment is a reversible phenomenon and Lombardy will no doubt go back to being a proud Nation, possibly in a free State. Of course, in the organization of a future Lombard State will be taken into account events that occurred in the meantime: in particular, it must be shown that fragmentation just mentioned has also given rise to development of very particular cultural and linguistic continuum. The most important aspect of this fact is that it does not allow you splitting Lombard territory in few homogeneous regions: why we believe that, in a hypothetical Lombard State, subdivision in many regions of relatively homogeneous linguistic and cultural diversity is the best solution to protect better all peculiarities of our beautiful land. 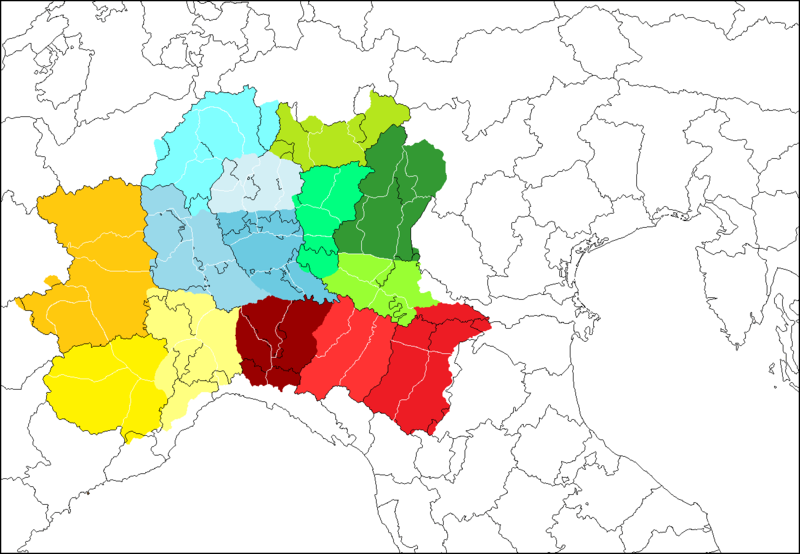 More precisely, we believe that optimal division of Lombardy would be in 15 federal cantons, which are grouped into regions for statistical and demographic information.